Public Ad Campaign: Project Art Cart-Bringing Art to the City Without an Agenda? Project Art Cart-Bringing Art to the City Without an Agenda? A while back I developed a quaint relationship with a small NYC marketing firm based on our mutual hatred for NPA, now Contest Promotions. They had run into some legal trouble as it seemed their illegal wildposting business was conflicting with NPA's illegal wildposting business. Essentially NPA filed suit against them which they could not afford to fight and therefore were strong armed into loosing a few of their big clients. It's a rough business apparently. After NPA's recent fall and the resulting white boards strewn around manhattan, Paper- Spaceship, took advantage of the liberated locations at least once. They explained to me that they were trying to promote local artists, although I took issue with the action because each poster had a small logo and website making the "artwork" an advertisement. Just a few days ago I was sent word of a new project they are working on with Five Inch Monster called Project Art Cart. 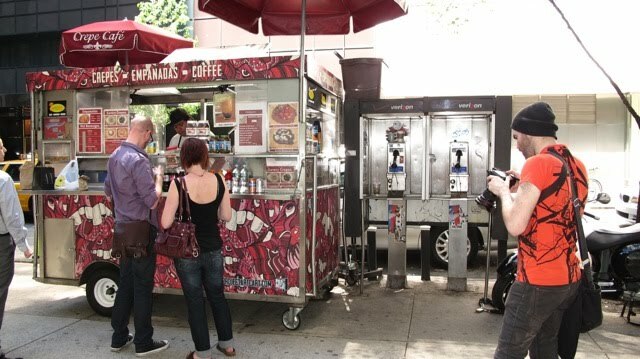 The idea is to use local artists to adorn the street vendor carts in NYC with local talent. Obviously I was concerned that this stunt might be another marketing tactic to promote a model which would eventually result in more unwanted commercial messages, but it appears to be on the up and up. I asked Paper-Spaceship to explain the business model hoping to figure out if there was some other motive besides a more aesthetic vending experience. This is what they told me. Project Art Cart is a side project that myself and a local artist have organized to continue our efforts to promote the unrecognized emerging NYC art scene. We're interesting in improving the urban community by enhancing the aesthetic of city streets all while providing a unique platform for emerging artists to showcase their talents – we look at it as a win/win situation for artists and the everyday street walking New Yorker. Besides branding each cart with the Project Art Cart logo and slapping on a URL to direct anyone that is interested in contributing, the real sponsor here is the artist themselves. Provided this project doesn't spin itself into some new venue for outdoor advertising and these carts remain adorned with artwork and not Calvin Klein ads, I think this is a good thing. It may not be the most interesting public art I can think of but it is nonetheless art on the streets with no visible strings attached. If you would like to participate, I would reach out to the the project managers and see if you can submit your designs for evaluation.